Solara Special, LP-Shaped Guitar from Johnson Guitars. Johnson released the single-cutaway, dual-humbucker Solara Special, a guitar designed for beginners or entry-level players. With a solid basswood body and bolt-on maple neck with satin finish, the Solara Special features dual open-coil humbuckers designed to deliver a fat, crunchy sound in either the neck or bridge position. The treble side cutaway is designed to allow easy access to the upper frets, and the nickel fretwire on the classic rosewood fretboard is finished with no rough edges for comfortable playing. 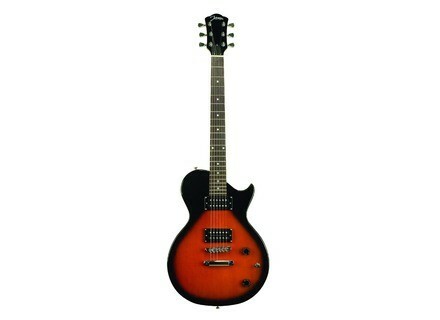 The Solara Special lists for $199.99 and is available in both gloss black and sunburst finishes. For more information, visit www.johnsongtr.com. Johnson Trailblazer Deluxe Johnson presents the solid spruce top Trailblazer Deluxe travel guitar. Avid Digidesign Eleven Rack The Digidesign Eleven Rack is a new recording and standalone effects processing solution designed specifically for guitar players. Hughes & Kettner Coreblade Hughes & Kettnerpresents Coreblade, its new programmable all-tube guitar amp, designed to meet the demands of modern metal guitarists.